Forum Index > Historical Arms Talk > Is this a practical weapon? Posted: Fri 26 Aug, 2016 2:28 pm Post subject: Is this a practical weapon? I was wondering if this "Fantasy Polearm" from "Museum Replicas Limited" would actually make an effective weapon. It's just a partisan. And I happen to like those. It would be effective at impressing your friends! How well it would work is going to depend on the metal, the wood, the weight but the basic design seems like it could at least work as a fighting tool. I always wondered if that particular MRL polearm was well-made. I almost bought it, several years back, but elected to spend the money on other things. Far from the strangest polearm I've seen. I would be more wary of the manufacturer than the design. Looks like it would make a GREAT weapon, like a glaive, assuming the construction is sound. Long weapons like this are killing machines. 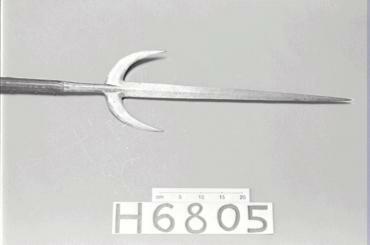 Looks like it could be used as a spear or a slashing polearm. The hooks are particular effective for hooking and pulling, VERY effective in the hands of skilled fighter. Not sure the forward facing hooks are necessary. Not sure the forward facing hooks are necessary. The lugs/hooks on many of the pictures I've seen of partisans are of the forward (assuming you mean "towards the tip") facing variety. I assume this attribute allowed one to catch and parry an opponent's weapon and, I expect, could aid in preventing over-penetration in the thrust. 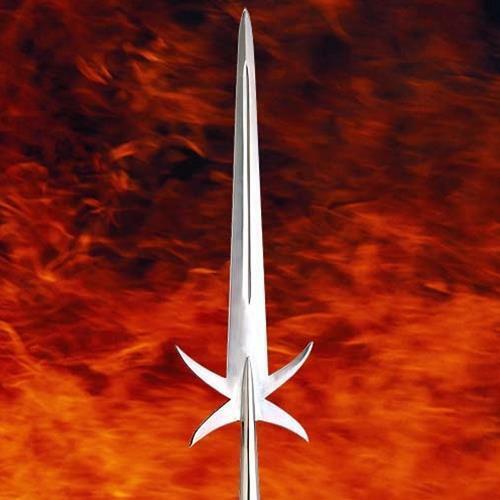 The "fantasy" element (if there is one) seems to be the rearward facing hooks, which, as you noted, would be very effective for hooking an enemy and pulling them down, throwing them off balance, etc., as is the case with other polearms with such an element. As for how "fantastic" that element may be, Figure 106 on page 131 of Waldman shows a figure on the upper right carrying what appears to be a partizan with rearward curling lugs - not simply rearward swept, but actually curling (could be an artistic element); and, Figure 110 on page 135 shows a "spontoon", which is described as a "short partizan" with forward, horizontal and rearward lug elements at the base. So, the item produced by MRL doesn't seem to be entirely outside the realm of possibility, but it does seem like it would be a rarity. I couldn't find electronic versions of either illustration, but the item on the left in the picture included could be the first cousin of the Figure 110 illustration, only with a broken tip on one of the forward lugs. Posted: Sat 27 Aug, 2016 10:39 am Post subject: Re: Is this a practical weapon? I was actually curious about the specs of this thing, but I don't see it anywhere on MRL's website. Do you happen to have a link to where this is, please? EDIT: Nevermind . . . found it . . . apparently it's a closeout that sold out. Regardless, while the stats don't say the type of steel or wood found on the piece (just that the metal is some version of high carbon steel), they do seem like it would make a perfectly functional weapon. 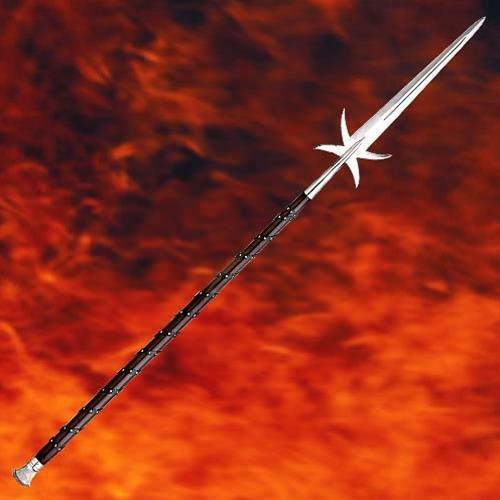 The "fantasy" element (if there is one) seems to be the rearward facing hooks, which, as you noted, would be very effective for hooking an enemy and pulling them down, throwing them off balance, etc., as is the case with other polearms with such an element. I seem to recall spears with rearward facing hooks for pulling down and then stabbing over an enemy's shield, in addition to the other benefits you mention. Posted: Mon 29 Aug, 2016 7:20 am Post subject: Re: Is this a practical weapon? Yeah, I should have mentioned that it sold out a long time ago. I was really impressed with the visual, but other expenses came up, and I didn't buy the dang'd thing. The one on the left seems a fairly close analog to the MRL weapon that I referenced, with forward and rearward projections. The horizontal ones seem useless to me, though. I would think that a more practical feature would be a much more substantial, sharp-and-pointy horizontal spike. Now, that would be deadly! I was initially thinking the horizontal lugs could be seen as more of a decorative element, but, considering things further, with the curvature of the upper and lower projections, a weapon parried between them might not catch, but slide down one curve, along the other, and then back towards the wielder of the partizan/spontoon. The momentum of the attack might be checked, but sharp injury or death could still be coming your way! To me, the central, horizontal lug would seem to be a measure against that type of slide, and allow for a full catch, truly braking the momentum of the other weapon. I don't know if there would be enough bite and torque to damage or break the other weapon (unlikely in my mind unless it was poorly made or already somewhat damaged), but I think the design would give the user of the weapon a greater ability to staunch and repel his opponent's attack and consider his next move. No, I haven't fought with anything of the like - just my own reasoning and applied logic based on what I've read and seen elsewhere. Hopefully some actual practitioners can chime in on my speculation. 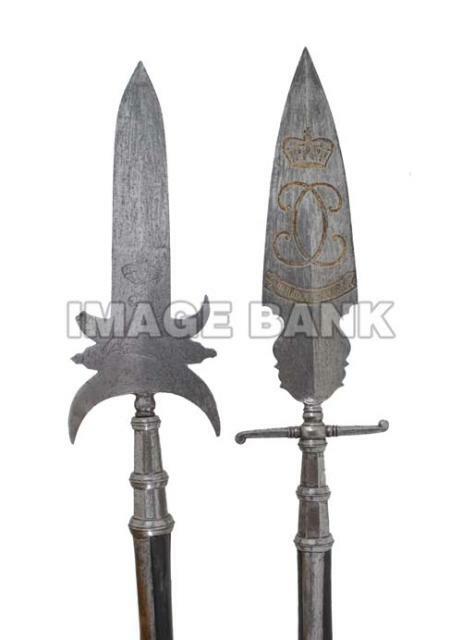 As for your comment on a horizontal spike, I don't know about the sharpened element, but if you search the "historical arms" section, you will find a couple of threads on a very large pole arm that I believe was classified as a glaive, but with a substantial crossguard rather than a rondel and a very long, acutely pointed and tapered blade - picture a type XVIIIb blade similar to the Albion Munich, but in type XVIII (single hand) length, mounted on 4' haft, and with a cross at least double the "standard" length (6", maybe somewhat more, on either side of the haft). The overall weapon, as I recall, was at least 7' long, and, I believe, Scandinavian in origin, but this is all from memory - it may just be that the individual that commissioned it was of Scandinavian origin! Fascinating! You certainly have an interesting perspective on the possible function of the horizontal lugs. And I will have to take a look for the weapon that you mention as I have the time. Thanks for the comment. I found the thread, but I remembered the dimensions wrong - although I'm nearly certain I've seen another example somewhere along the way that more closely resembled what I described. Or, maybe I'm just running low on brain cells! I looked at the thread that you referenced -- awesome weapon! Thanks for sharing.